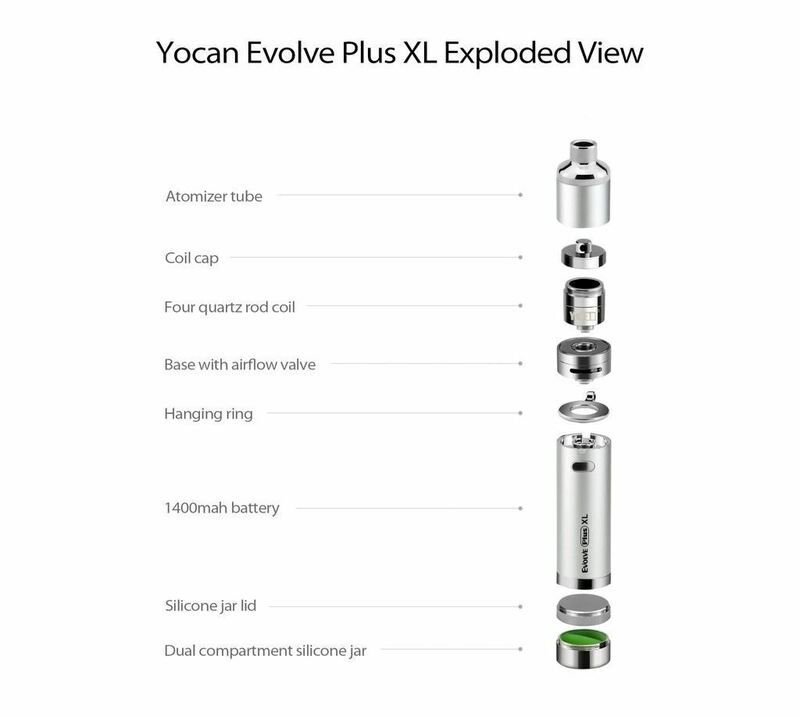 This Yocan Evolve XL Plus just came to us here in the office, and we gave it a thorough testing ! This is a unit, although advertised to go with E-juice, is for wax/shatter/concentrated cannabis oil primarily. I wouldn’t suggest anyone try it with E-juice, however this we did not test, considering the design. This is one handy, mighty unit for concentrates ! 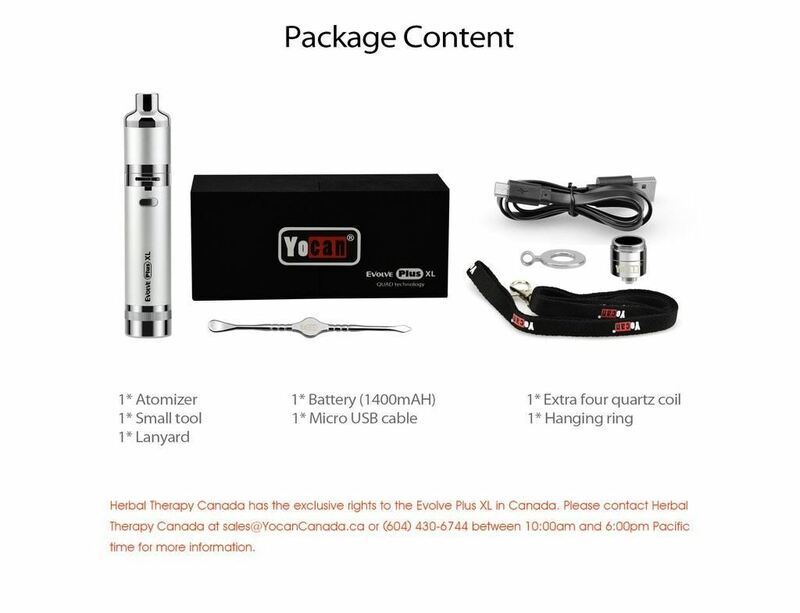 The large battery is an improvement, as is an adjustable air flow, a magnetic cap, and a great coil system. There are 4 coils in each housing as u can see, and the rods (wicks) are made of quartz. Provides a wonderful tasting experience, really bring out the flavor of your oils. In our opinion, they are much tastier than a dab nail or banger. We’re using it with the 1400 mAh battery, however, the atomizer itself is 510 threaded and can be used on your mods at roughly 15-20 watts! 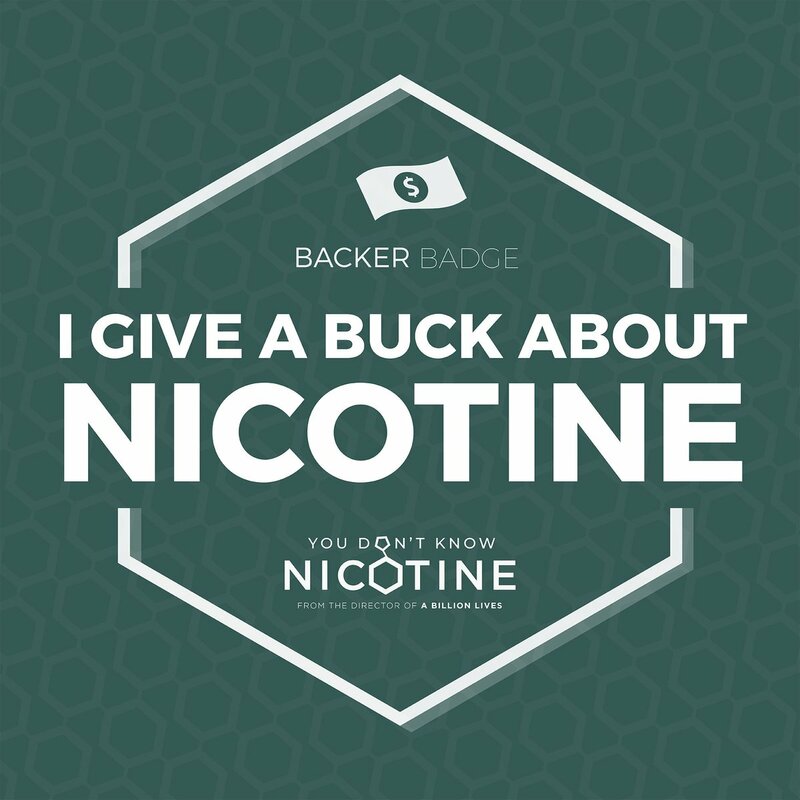 The adjustable airflow makes the experience tailored to how you like your vapor. The magnetic cap resists sticking or cross threading, or the time of un-threading it. 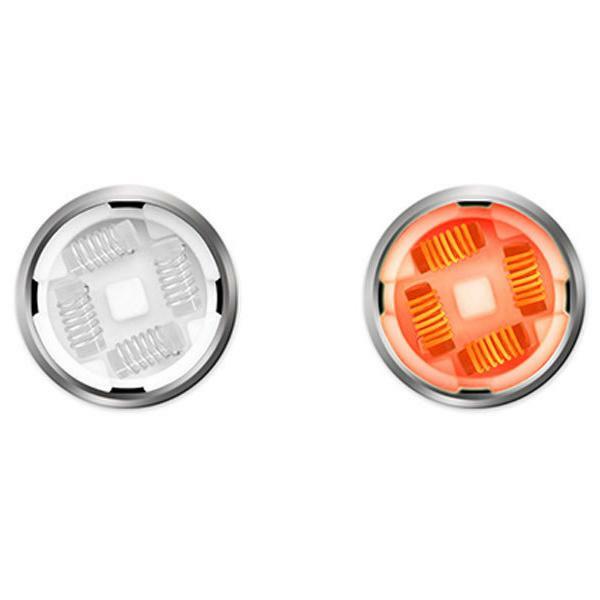 The coil cap goes on and off with ease. You must finish each dab of oil completely before adding the next load. Check under coil and battery top for any oil leakage. Clean with isopropyl alcohol, preferrably 99%. You can also soak coil and parts, except the battery, in isorpropyl alcohol. Keep the parts clean for best flavor, experience, and product safety. The box is really classy, we use ours to keep it clean n safe. Opens in a really cool way. Yes, it was all there. You may have to click the image to see it better, depending on your browser settings and this template’s limitations. Yes, it even has a handy 2-section silicone concentrate stash in the bottom. I have to also say, we found the machining on this to be extremely well done. Everything screws together so nicely and securely. Also, they come in different colors! Our choice was black, which is a popular color in the vape word. Choose your own ! They even have a glow-in-the-dark version ! NOTE: We haven’t owned this unit long enough to tell you how long a coil lasts. Of course, this is heavily dependent on use and habits of use. We’ll keep you posted in a future article. Finally, we’d like to say it’s a great product, the tastiness mmm. Their little bell/whistle add-on is the silicone stash jar located at the bottom. The little dab stash is cute, had to add that n there. Well as always, have a good vape !